This project is about growing meat- and laying chickens on a small scale as occupational therapy project for the benefit of the psychiatric patients and their families. ANUPF association is formed by employees of the psychiatric centre Sosame who, after their working hours, voluntarily help to collect money to buy food and to re-socialise the psychiatric patients who are casted away by the society. By selling eggs and chicken meat they will have an income to buy food and medication for the patients and their families and will fight poverty this way. The chicken farm will be taken care off by and for the patients under the supervision of the occupational therapist of the centre. The final objective is to prevent the stigmatizing of the psychiatric patient. This project will be started with the help of Vleugels van Hoop but has as target to become self-financed. Psychiatric patients, and their families, of the psychiatric hospital Sosame in Bukavu. The project is evolving well; we received the funds on March 27th and immediately started with equipping the chicken farm. I received the approval and signed cooperation agreement from Vleugels van Hoop in February and we waited for the arrival of Mrs. Veronique Coppin who brought the funds with her, together with the purchased breeding machine bought in Belgium. In general all goes well: the chicken farm is equipped, the purchase of chickens done, chickens are vaccinated and the breeding machine is operational. We fear though that the first breeding will not be a success because of a wrong action as today we are the 23rd day of the breeding period. The egg production has started but we are afraid on not having sufficient means to support the patients with the purchase of medication and food. All funds were spend as planned. The overview of activities and the details on the spending of the funds you can find attached. We have a balance of 0 € now. 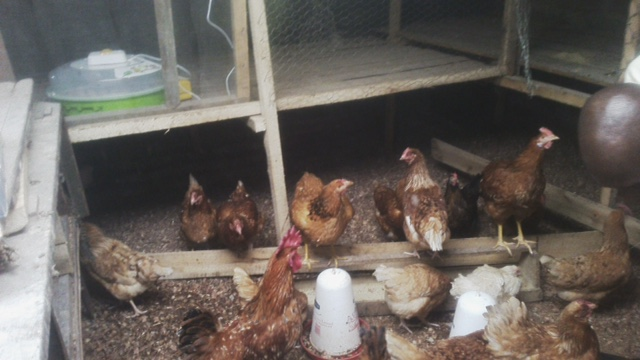 The food for the chickens was underestimated: We fear a shortage of food at the end of the 2nd month as well as an increase of prices as there is a shortage of corn which serves as basic food for the chickens. Shortage of space and fence to allow the chickens to run freely around within the fence or on the courtyard. A setback: on day 11 all chicks were destroyed by wild rats. We look into a way to protect the chicks place before the 2nd crucial period to offer needed protection. The chickens start to produce eggs slowly and are getting in good shape. They get medicines to improve the egg production. 90 pieces were sold and 51 eggs were put in the incubator (who soon will give chicks). The funds were all used as foreseen cfr activities and expenses in attachment. This month there was a contribution from the members to guarantee continuity and further investigation of the chickens place (see pieces of justification in attachment). The project is evolving well and the chicken start to, slowly, produce more eggs. They are producing 1 egg a day now and getting food and thereby help 3 psychiatric patients, who are very poor, to pay their medication. A part of the eggs is used as supplement to the food for hospitalised patients who do not have close relatives. An egg meal is prepared for them, every weekend, in the kitchen of the psychiatric centre ‘sosame’. The chickens are producing well (1 egg a day). This month we had 720 eggs. We have 9 chicks of about 6 weeks, 6 of 1 day and we are waiting for the rest to be hatched. The chicks we have are from the eggs from the chicken farm. All funds are consumed as foreseen. The activity planning and invoices are attached. For this month we do have enough food, medication and vaccinations for the chickens. However, there is nothing left over. As always the food for the chickens: Because of increasing the hatching, the need for food is increasing. The chicks are still too small to give them to the family of the patients, as we are afraid they will die too soon of will be eaten before they produce eggs. We have not sufficient space and lack a fence to allow the chickens to run in open air. The security at the current place and in the cages is not enough, as we will have more chicks every month. The lack of a plot on which we can build our chicken farm. We are afraid not to be able to fulfil the need of the patients because of the limited capacity of the chicken farm. With 35 chickens the yield if too small to cover the need of the poorest people and to other activities of the association. Problems to pay the veterinarian for his consultations.